Corporate Volunteering Days at the farm are a fantastic way of boosting team morale and productivity. They are also a great way to fulfil your corporate responsibility while having lots of fun. By choosing to spend your volunteer day with us, you will be making a positive contribution to Lawrence Weston and the surrounding community, and to the wellbeing of your staff. Outdoor-based corporate volunteering days have the edge over other kinds of volunteering, as they offer a complete and refreshing change to the office environment as well as the mood boosting, stress busting benefits of being in nature. Creativity, focus, health and energy can all be improved, as well as relationships and communication within your team. 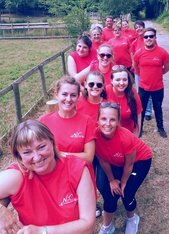 Our bespoke Corporate Volunteering Days are tailor made for you and can include challenging activities such as fence and feature building or creative activities such as cooking or weaving in our idyllic woodland. Call our Volunteer Coordinator Ian on 0117 9381128 or email ian@lwfarm.org.uk to discuss pricing and further details. With indoor facilities for lunch and refreshments, on-site parking and an easily accessible situation close to the M4/M5 J17/18 we are popular and ideal choice for many Bristol and nationwide companies. Many organisations have developed an ongoing relationship with the community farm in which they return each year.